H.E. Yahya bin Said bin Abdullah Al-Jabri, Chairperson of SEZAD, signed two agreements with Renaissance Services Company. The first relates to granting usufruct to the company to expand the Renaissance Village in Duqm at an additional area of ​​71,805 meters while the second grants the usufruct to the company for the construction of a leisure club on an area of ​​ 10 thousand square meters. 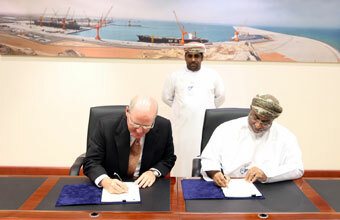 Stephen R. Thomas, CEO, signed the two agreements on behalf of Renaissance Services Company. Through expanding its Village in Duqm, Renaissance Services Company seeks to keep pace with growth in the number of population in the SEZD and the increased pace of projects. The project includes the construction of various rooms, restaurants and many other services. The Company's investments in the new projects shall be OMR 8 million, including OMR 5 million for the expansion project, which will take between two and three years and provide 100 new jobs. Renaissance Village in Duqm that are currently being implemented accommodates more than 16 thousand beds and is expected to complete during the current year. As for the leisure club project, the Company's investments are OMR 3 million. This project shall provide about 40 new jobs. The entertainment club, implemented in the tourist area, shall include restaurants, open playgrounds, swimming pools and a number of other services.